David Laʻamea Kamanakapuʻu Mahinulani Nalaiaehuokalani Lumialani Kalākaua was born in Honolulu to High Chief Kahana Kapaʻakea and the High Chiefess Analea Keohokālole, on November 16, 1836. Per the custom of the times, he was hānai (adopted) by the chiefess Haʻaheo Kaniu, who took him to Maui, where the court of King Kamehameha III was located. When Kalākaua was four, he returned to Oʻahu to begin his education at the Royal School. By 1856, Kalākaua was on the staff of King Kamehameha IV. In addition to his military duties, Kalākaua served in the Department of the Interior; in 1863, he was appointed postmaster general. In December 1872, King Kamehameha V died without designating an heir and per the law, an election was held to determine his successor. 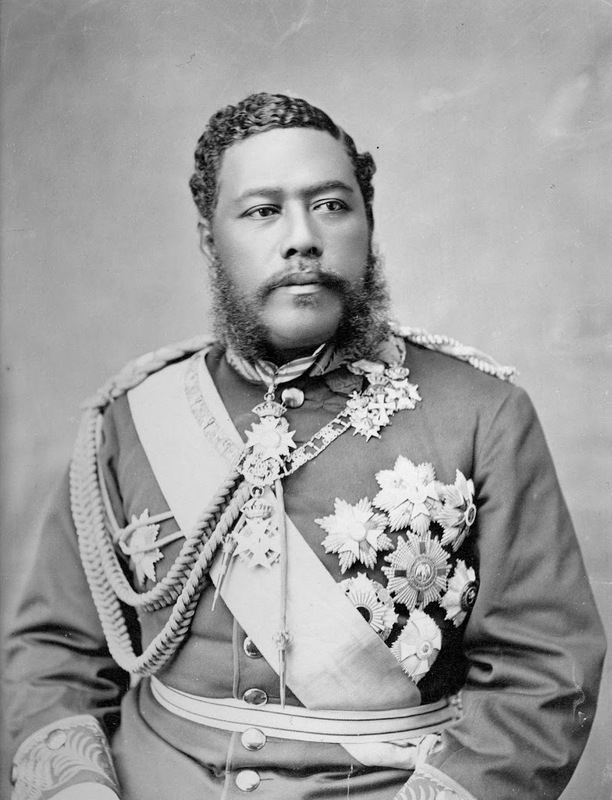 Kalākaua made his first bid for Hawaiʻi’s throne in 1873. The kingdom’s Constitution stated if the monarch dies before naming a successor “such vacancy, shall cause a meeting of the Legislative Assembly, who shall elect by ballot some native Alii of the Kingdom as Successor”. They were presented with two choices: Kalākaua, who ran on a campaign slogan of “Hawaii for Hawaiians” and William C. Lunalilo. Lunalilo won; but he died a year later, leaving no successor. On February 12, 1874, nine days after the passing of King Lunalilo, an election was held between the repeat candidate David Kalākaua and Queen Emma – widow of King Kamehameha IV. Kalākaua won. The Treaty of Reciprocity-1875 between the US and the Kingdom of Hawai‘i eliminated the major trade barrier to Hawai‘i’s closest and major market. Through the treaty, the US gained Pearl Harbor and Hawai‘i’s sugar (and other) planters received duty-free entry into US markets. Under Kalākaua’s direction, the cornerstone for ʻIolani Palace was laid on December 31, 1879. Construction was completed in 1882; in December of that year Kalākaua moved into his palace with his wife, Queen Kapi’olani, the granddaughter of King Kaumuali’i of Kauaʻi. Kalākaua was the first Hawaiʻi sovereign to visit the United States, as well as circumnavigate the globe (he did that twice.) His travels were to study the matter of immigration and to improve foreign relations. He also wanted to study how other rulers ruled. His friend, Robert Louis Stevenson described Kalākaua as “a cultured intellectual of unusual mental powers.” A poet and lyricist, athlete and consummate politician, he was responsible for initiating the resurgence of Hawaiian cultural arts, particularly hula. Kalākaua was a staunch supporter of native Hawaiian civil rights. In part, this led to a rebellion in 1887 forcing him to sign a new constitution relinquishing his powers as head of state and relegated him to a figurehead; it also imposed a fairly high property ownership qualification on those running for the new legislature. This new constitution became known as the Bayonet Constitution. Because he and his wife Queen Kapiʻolani did not have any children, his sister, Liliʻuokalani succeeded him to the Hawaiian throne. (Kalākaua was known as a Renaissance Man and into technology – those are the subjects of future stories.) I have added other images of Kalākaua in a folder of like name in the Photos section on my Facebook page.